Annually, I don’t consider overnight bike touring/camping before at least the month of May due to the high probability of inclement weather and my preference of being coddled by warm breezes and sunshine whilst touring. Nevertheless, the lower mainland of British Columbia had amazing weather in April this year and my urge to get out even for an overnight cycling venture spurred me on – as did Basil who was also getting itchy feet… pedals??? Without going too far, I am fortunate to have the British Columbia’s Gulf Islands almost at my doorstep, so the decision was easy and the early jaunt would be to Narvaez Bay on Saturna Island. 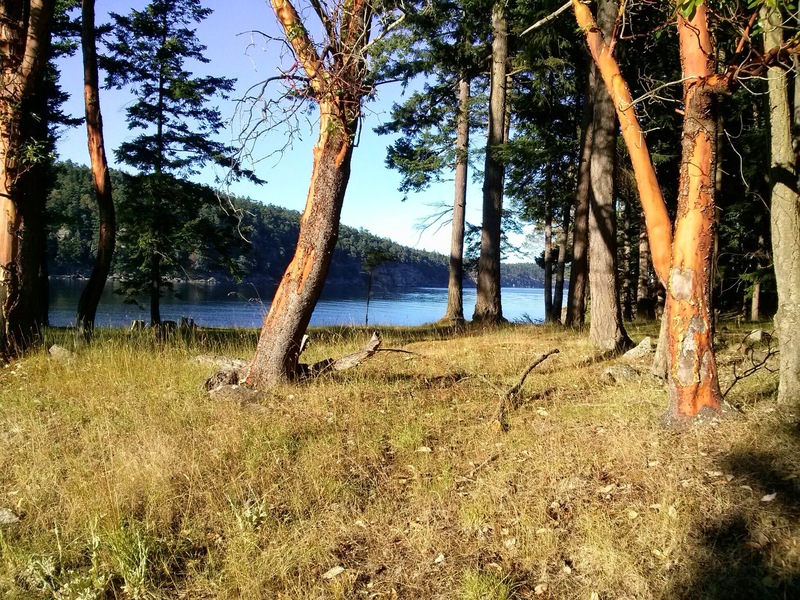 Just a few years ago, Narvaez Bay was added to the Gulf Islands National Park Reserve and a small walk-in camping area was created – which was good news, as prior to the creation of this campground there was no camping available on Saturna Island. However camping is limited to seven raised pads with picnic tables by the waterfront and an overflow area away from the waterfront with no tables. Saturna Island is the southernmost island of British Columbia’s Gulf Islands and is virtually on the border between Canada and the USA. 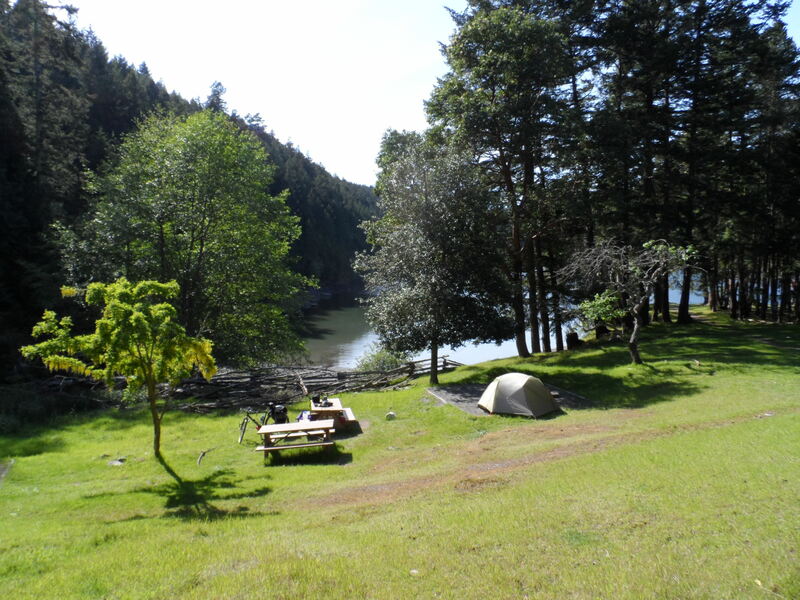 All camping at Narvaez Bay is walk/bike-in, pack in and pack out rules apply. There are no trash bins and no potable water. There is however one pit toilet serving the campground. Water and food can be purchased at the Saturna General Store, 6km before the campground at the junction of Narvaez Bay Rd. and East Point Rd. From the ferry landing at Lyall Harbour to the campground gate is only about 8km total; from the gate of the park it is one kilometre down to the camping area along a sometimes steep path. Once off the ferry I waited to let the vehicle traffic escape before starting to pedal off up the steep hill of East Point Rd. 2 km towards the Saturna General Store at the junction of East Point Rd. and Narvaez Bay Rd. As there is no water at the campground, I stopped here to grab a gallon of water and distributed that between whatever smaller containers I had packed with me. I use some folding canteens that fit into my panniers better than a gallon jug does! The store has a good selection of just about everything so it is a good place to purchase some last minute supplies if needed. The small hardship of having to pack water and sundries to the camp is a paid off with a fantastically scenic location and virtually waterfront campsites. After packing my water set I off for the remaining 6 km hilly ride to the park. The road is paved (avec potholes) for about half that distance and then turns into hard packed dirt and gravel (also avec potholes). As you can guess, not a high traffic route! In fact as I mentioned earlier, the island’s official population is approximately 300, but realistically more like 150 full time residents, the locals tell me. Hence none of the roads on the island are busy – they are narrow and hilly though! Arriving at the park gate, I then rode the steep dirt track down to the level ground of the waterfront areas. At the bottom of the track is Echo Bay, another very scenic part of this reserve. From Echo Bay I continued along the level part of the track which deposited me at Narvaez Bay and the camping areas. 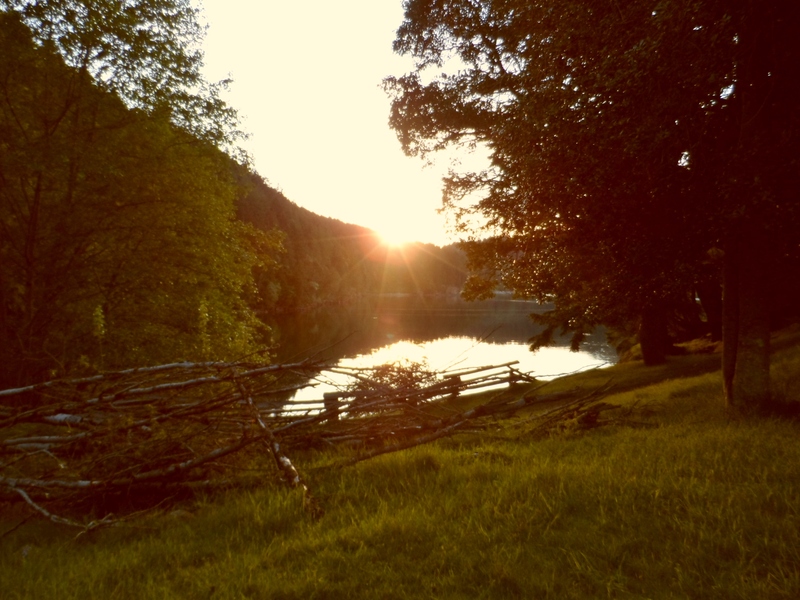 Pick of the Campsites – an easy choice with no one there! The park is a quiet area and even the bay has few infrequent boaters visiting. In April the camping area was deserted as was the rest of the park, so I had the pick of the campsites when I arrived. Officially the park doesn’t open until the Middle of May, but there is a pay box to leave the camping fee regardless of the time of year. At $4.90, it is a bargain anyway! The pit toilet seems to be open all year round so I don’t really know why the “official” opening date is in May – it could be just a National Parks policy countrywide, but here in southern BC where the climate is relatively mild even in winter, the date should really be revised. After setting up my tent and fixing some food for lunch, I was joined by a few day visitors to the park, which made me feel not totally alone, but they were soon gone and I was left to my solitude and peaceful surroundings. I found a sunny spot and pulled out my Kindle for some serious reading – life’s tough ain’t it! 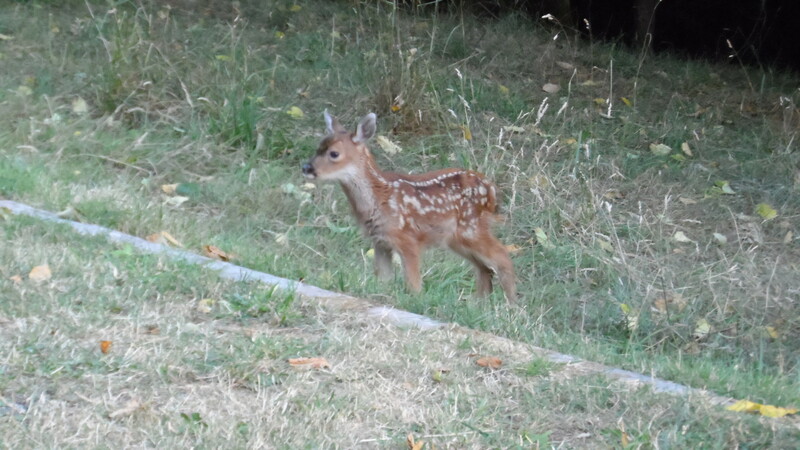 The only disturbances were the deer – many deer! Mostly doe with fawns who did not seem to mind my presence whatsoever, and happily grazed just a few feet away from my tent and table. The only problem with the presence of so many deer was that I had to be very careful wherever I walked to avoid the multitude of deer poop! After my relaxing afternoon I had the chore of making a light supper and then set off to do some light hiking around the shore and over to Echo Bay and area. On returning to my site, the temperature was cooling off, so I made a hot coffee to warm me up (with a nip of brandy, of course!). I sat for a while and watch the sun disappear over the nearby hill across the bay and retired to my warm sleeping bag for a little more reading – that didn’t last long as my eyelids quickly began getting sleepy! 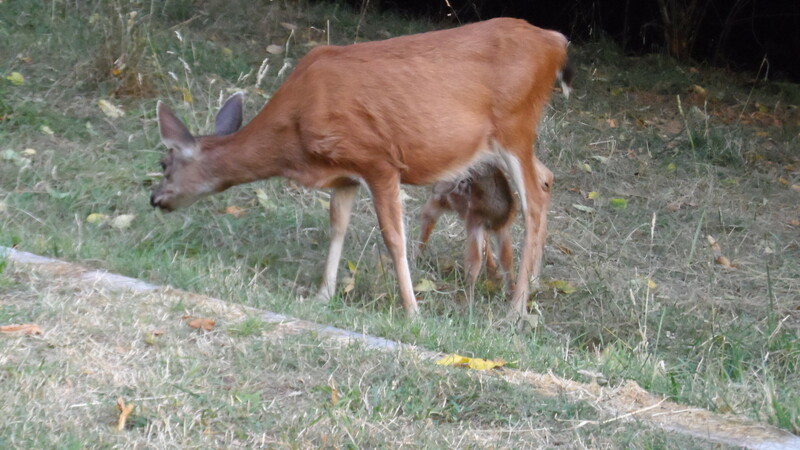 I woke up early, just about at first light; then hearing something outside the tent – I peeked out and it found that it was just the deer moving around close to my tent. So I got up and made some coffee and wondered about making some oatmeal, but a hot breakfast at “The Bus” seemed like a much better option! I packed up and rode the short distance to the bottom of the steep track out of the park, then it was “cross-training” time, ride a bit, push a bit! Eventually I reached the top and started riding proper back to Lyall Harbour. I parked my bike at the ferry terminal and walked back up the steep hill a little way to the cafe/bus. There I sat at one of their eclectic tables above the roadside and had a wonderful hot breakfast with fresh coffee and orange juice while watching the area come to life as people arrived for the infrequent ferry. After breakfast I walked back to the terminal to wait a while longer as the morning ferry was running late according to the very pleasant lady attendant whom I had a nice chat with while we waited at the dock. The ferry soon arrived and I was on my way back to Swartz Bay on Vancouver Island, albeit with a couple of stops at Mayne and Pender Islands to load/offload traffic. No payment was required for the trip back to Swartz Bay as the return fare was included in the original fare out to Saturna. 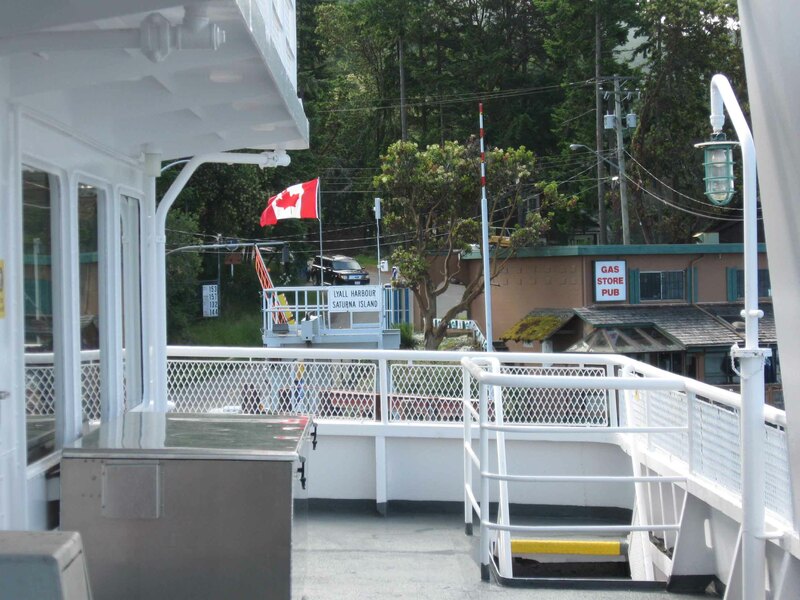 This is also the case with most of the ferry trips between the Gulf Islands and Swartz Bay. So basically a quick sailing then a short ride home after spending a little over 24 hours at one of the most scenic areas in British Columbia. AdamK & (Bloody Deer Poop!) Basil. 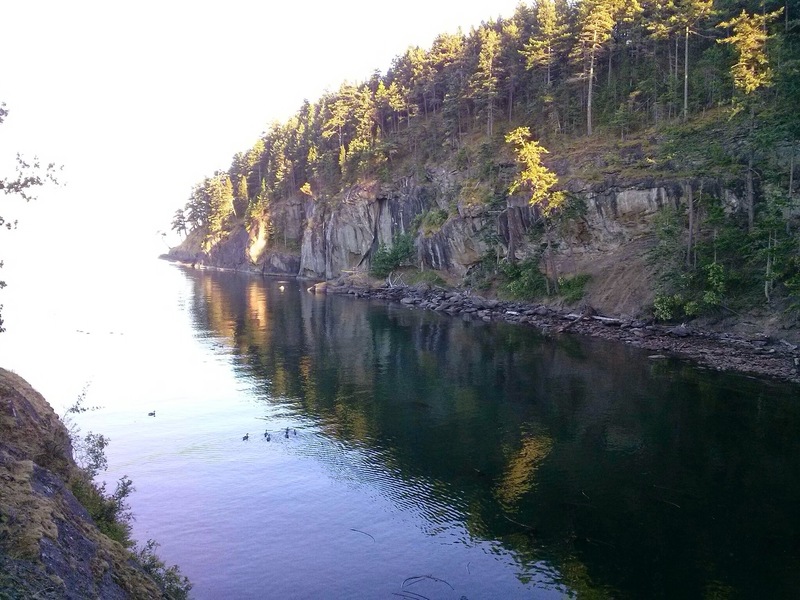 This entry was posted in Cycle Touring, Gulf Islands, S24O, Saturna Island and tagged BC Ferries, Bike Touring, Camping, Gulf Islands, Gulf Islands National Park Reserve, Narvaez Bay, S24O, Saturna Island on April 28, 2016 by AdamK's Cycling & Travel.